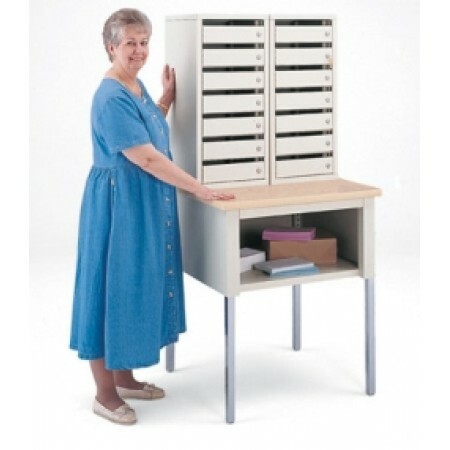 Side by Side Double Document Security Station, 14 Doors - Choose from 3 Different Lock Styles, (Table Sold Separately, See Below). Private, secure mail delivery for individuals in one central location. Deliver the mail through extra-large 7/8" front mail slot or through the large locking rear door - that exposes all the individual pockets when opened. 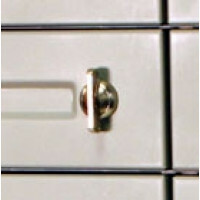 Mail recipients unlock his or her private front compartment to retrieve the mail. Units can be bolted together for a strong bank of steel security boxes. Perfect for doctors, students, or patient mail. HIPPA compliant. Strong, all-steel construction has scratch-resistant, putty-colored enamel powder paint finish. 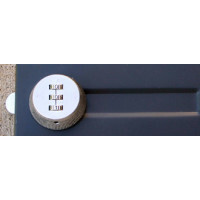 Choose from 3 different lock styles: key lock includes 2 keys per door, thumb turn and combination locks. 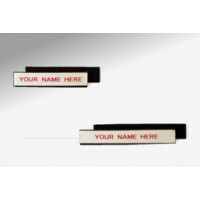 For easier pocket identification don't forget to order optional door labels (L10 or L22). • Security shell is 20 gauge steel with welded construction. • Formed with bends and brakes for maximum strength. • Internal shelves are 20 gauge steel and have a front and rear bend for pocket identification and strength. • Full rear door swings out of the way and includes 2 keys. • Baked on powder paint in formulated for chipping and corrosion resistance. Have questions or need help? Please contact our sales department.